The Gerousia (γερουσία) was the Spartan council of elders, which was made up of men over the age of sixty. It was created by the Spartan lawgiver Lycurgus in the seventh century BC, in his Great Rhetra ("Great Pronouncement"). According to Lycurgus' biographer Plutarch, the creation of the Gerousia was the first significant constitutional innovation instituted by Lycurgus.The Gerousia consisted of 30 members in total, of whom twenty-eight had to be over the age of sixty, and the remaining two members were the two Spartan kings, regardless of their age. Other than the kings, the members of the Gerousia (gerontes) were elected, and served for life. Gerontes were elected by acclamation, and a group of men in a separate building would judge which shout had been the loudest. These elected members included a number of members of the two Spartan royal houses, and membership was probably restricted to aristocrats. The Gerousia had two major roles. 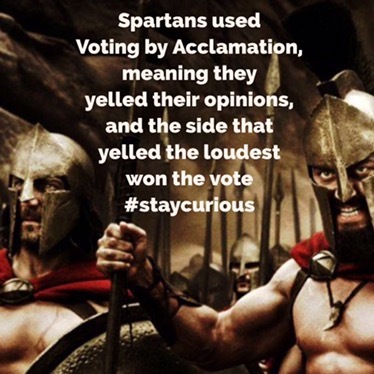 It debated motions which were to be put before the citizen assembly, with the power to prevent any motion from being passed on, and functioned as a Supreme Court, with the right to try any Spartan, up to and including the kings. The Great Rhetra suggests that it had the power to overturn decisions made by the Spartan assembly. Henryk Siwiak, a Polish immigrant whose murder on 9/11 was the only recorded homicide in New York that date.